The Arthur Williams Creative Fund is the Student Union’s and Arts on Campus’ new fund to support student initiated arts projects. The fund is to encourage students to run a project in any area of the arts; theatre, music, film, art, literature, gaming, photography or indeed any other artistic endeavour, stretching the meaning of art. Students can apply to fill out an application form applying for funding. Funding amounts will range from £50 to £250, depending on budget and ambition. This money to be used for materials, facilities, space, promotion, etc. If the application is approved in the first stage by the Committee an interview will be arranged. If the interview is passed funding will be awarded. At the end of the year a prize of £400 will be given to the project or event funded by the fund which a Committee of judges to have been most successful. 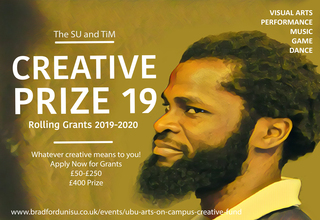 Funding will be available to enable students to broaden their horizons through arts, providing equipment, facilities, opportunities or support for student societies, groups or individuals. Arts on Campus will also seek relevant Mentors for students to help them realise their vision. Arts on Campus and UBU are very keen to provide as much support as possible, providing finance from the fund but also working with participants to provide guidance and expertise. Finished artworks will be expected to be made public in some way in affiliation with the Fund, whether this is through a performance or display on Campus.